Staff Recommends @CMPL: Meghan Recommends "Eighth Grade"
If you are a fellow grown-up, can we just agree that middle school was the worst? Yeah? Great. 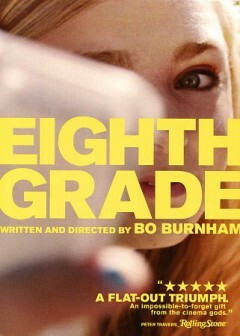 Well against all reason, I encourage you to step back into those loud, sweaty halls to experience the last week of eighth grade with Kayla Day in the film Eighth Grade. Kayla is shy, has a hard time making friends, and is on her phone ALL THE TIME. Kayla films advice videos for YouTube, telling her nonexistent audience to “be yourself” and “put yourself out there” and “be confident” even while she struggles to follow her own advice. She gets anxious in social situations. When her dad cajoles her into going to a classmate’s pool party, she nearly has a panic attack in the bathroom changing into her bathing suit. But Kayla tries, and she not only jumps into the pool, she starts up a conversation with the “mean girl” host the following week at school. Kayla is thoughtful, and when tested, she sticks up for herself and makes good choices. Eighth Grade made me feel for Kayla, cringing as she tries to impress a boy she likes, and aching for her as she burns a box of her “hopes and dreams” from sixth grade. She just wants to have friends, and hasn’t learned yet that some people aren’t good friend material. Kayla: Can you not look like that please? Kayla: Just, like, the way you're looking. Dad: Looking at the road? Kayla: You can look at the road, Dad. I obviously didn't mean that. Just, like, don't be weird and quiet while you do it. Dad: Sorry. Hey, how was the [high school] thing? Kayla: No, you were being quiet, which is fine. Just, like, don't be weird and quiet 'cause, like, I look over at you, and I think you're about to drive us into a tree or something. And then I get really freaked out, and then I can't text my friend. So just, like, be quiet, and drive, and don't look weird and sad. Um, ok? “This too shall pass” goes equally for parents and teens, I guess. While I wish I could give every anxious teen a hug and assure them that NO ONE has it all figured out by the end of eighth grade, some lessons kids just have to learn for themselves. The film is rated R for language and some sexual situations. I did not watch it with my teen, but having seen it, the potentially objectionable content is probably nothing new to her. Seeing the film together might be uncomfortable, but it could also be a good way to start important conversations about self-respect, social media use, and expectations for behavior. That said, you can read more about the film at Common Sense Media, or pre-screen it (and think about what you want to say!) before viewing together. Recommended for adults and possibly teens.